Can I share your story on Learning At The Primary Pond? As I’m writing this, in 2019, it’s been 7 years since I started this blog. I can’t believe it’s been 7 years already!! Can I share with you the story of how I got started? Seven years ago, I was teaching Kindergarten, and I really enjoyed my job. I had the sweetest students and families. I was fortunate to have autonomy to do what was best for my students. However, I felt like I wanted to do more….I wanted to share what I was doing with other teachers. I knew how much *I* loved visiting different classrooms and learning from other teachers, and I hoped to give back in a similar way. Circus and all, I decided to try out blogging as a way to share with other teachers. I had no idea what I was doing and my site didn’t look great. But I went for it anyway! 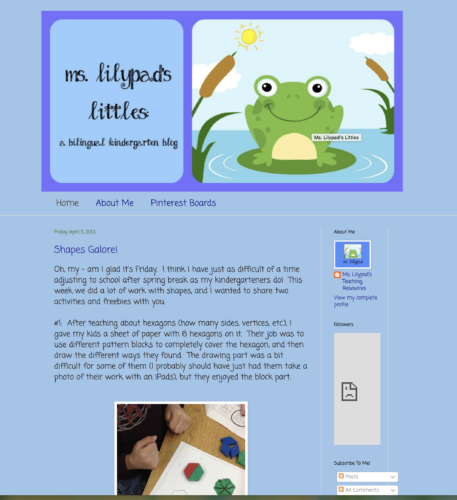 My classroom at the time was frog-themed, so I carried that over to the blog. Now, 7 years later, the site looks a liiiiitle different and I’ve written over 300 posts (holy cow)! I couldn’t be more thankful for the opportunities my blog has given me—opportunities to share and connect with YOU! Could we use my blog to tell your story? To inspire other teachers? To teach other educators? Overcame a big challenge related to being a teacher or balancing school / home? Teach in a unique school setting or outside the U.S. and would like to share a “day in the life” at your school? Have a special area of expertise, like speech/language pathology or occupational therapy, and you’d like to share tips for general education teachers? Use my teaching resources with success and want to share how you’ve adapted them to meet your kids’ needs? Are struggling with something and want others to know they aren’t alone—and even seek ideas from my blog readers?